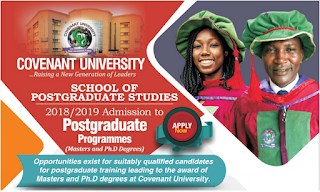 Covenant University School of Postgraduate Studies Admission Form into the Postgraduate Programmes for the 2018/2019 Academic Session Begins - See Courses, Admission Requirements, Method of Application, Screening Dates, Time and Venue. research.Accommodation is available for interested students at the ultramodern postgraduate halls of residence. 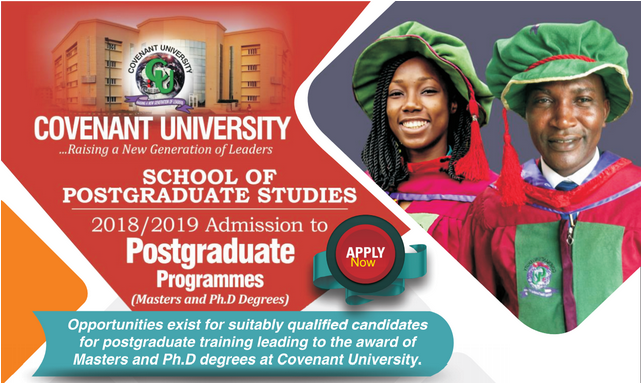 To be considered for admission into any of the postgraduate programmes, a candidate shall satisfy the general University requirements as well as any special requirements for admission into the programme of interest. Candidates seeking admission to the Doctor of Philosophy (Ph.D) degree Programme of Covenant University must possess the Bachelor’s and Master’s Degrees of Covenant University or any other University recognized by the Senate of Covenant University in the relevant discipline.To qualify for direct entry into the Ph.D degree programme, a candidate must have a minimum CGPA of 4.00 on a 5.00 scale or equivalent ( 6 0 % ) in the Masters(M.A/M.Sc/M.Eng/M.Tech) degree result. Degree(s) in Accounting; possession of final professional certificates (ICAN, ACCA, CPA,etc.) is considered an added advantage. and Actuarial Science may be considered. Degree in View: M.Sc., MPhil., Ph.D.